Howies was the venue for some birthday celebrations recently. I was also able to celebrate Howies’ gluten free credentials as I had a great meal and may have found a new favourite. The menu at Howies is nicely simple, with a small range of options, all of which look fantastic. Each GF meal is marked clearly, alongside the vegetarian options, so choosing is very easy and straightforward. The staff are completely clued up and nothing is too much trouble. A starter which included oatcakes, came separately from others, with GF oatcakes pointed out; and each server reminded me I was eating the gluten free choice. The food is completely delicious and well presented. 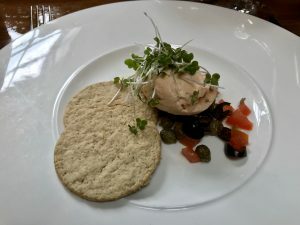 My starter of hot smoked salmon mousse with horseradish, capers and olives disappeared quickly – the zing of the capers and horseradish cut through the salmon mousse nicely. My main course of pan roast chicken breast had a lovely mix of greens, sauce and potatoes. The range of GF main courses was good too: I could have enjoyed the daily casserole or fish, salmon or a salad – a pretty good choice in my view! While I do not always choose pudding, this day was a big celebration, so I went for the GF brownie with ice cream though, again, there were several choices. 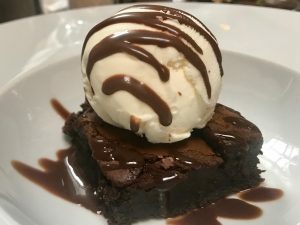 I loved the service and overall experience at Howies – the staff are great, the wine flowed and generally I found eating gluten free to be straightforward, delicious and of a very high quality. I am really pleased to highly recommend it!